Horlivka, another rebel stronghold some 20 miles north of Donetsk, has been under siege by Ukrainian forces for weeks. In previous days, they have heavily shelled the city of 250,000, resulting in dozens of civilian deaths and severe damage to infrastructure. In announcing the loss, which Girkin said was “nothing strange” since he had “repeatedly warned” it would happen, the pencil-mustachioed self-declared defense minister of the breakaway Donetsk People’s Republic recognized the significant advancements made by government troops in recent days. Andriy Lysenko, a spokesperson for Ukraine’s National Security and Defense Council, told reporters in Kiev that he could not confirm the report that government forces conquered Krasnyi Luch. “We give information on everything that has been fully liberated. As soon as some other cities are liberated, we will inform you of this. We cannot confirm this information so far,” Lysenko said, adding that Ukrainian forces have liberated the communities of Kruhlyk and Miusynsk in Luhansk region and Panteleimonivka in Donetsk region over the past 24 hours. 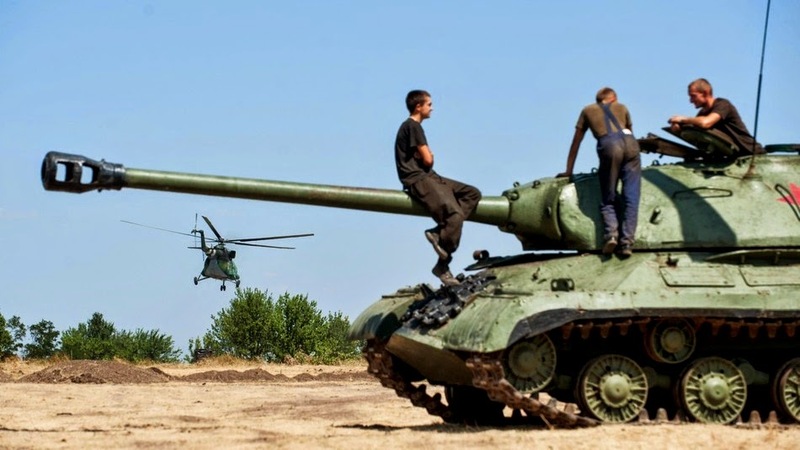 Battles are currently underway in Mnohopillia, Stepanivka, Hryhorivka, Krasny Yar, Pobeda, Shyshkove, Komyshne, Novohannivka, Krasna Talivka, Dmytrivka, Sabivka, and Luhansk airport, Lysenko said. “The anti-terrorist operation forces carried out airstrikes upon bases and strongholds. In particular, 10 armored vehicles with crews were destroyed near Horlivka. Ukrainian pilots also destroyed another convoy of military vehicles near the town of Antratsyt, Luhansk region,” he added. Saturday morning in Donetsk, residents awoke to the sound of explosions from artillery shells near the airport, the scene of several pitched battles over the course of the four-month-long conflict between rebels and Ukrainian troops. The mayor’s office said in a statement on its website that projectiles had hit homes in two regions of the city, trapping a woman and child. Emergency service workers dug them out, and treated them at the scene. It is uncertain which side fired on the homes. At a rebel-block post on the south end of Donetsk, Mashable arrived moments after a salvo of Grad rockets exploded on the highway and in the adjacent wheat fields, sparking small brush fires. 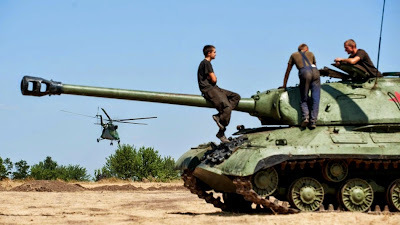 Nervous rebels, who said the rockets had been fired from Ukrainian positions five miles southwest, waved through cars and rushed to load their machine guns in case of an attack. At the Ukrainian positions, army commander Serhey Bohatyrev from the 20th Dnipropetrovsk Assault Brigade gave Mashable a tour of the recently recaptured towns of Marinka and Krasnohorivka. With Ukrainian pop music blaring from his rickety white Skoda sedan adorned with the country’s blue-and-yellow flag, he weaved through a maze of abandoned block posts once manned by the rebels. The army, with help from the Right Sector, Dnipro and Azov battalions, recaptured the cities this week, Bohatyrev said. But the victories didn’t come without severe damage to several residential and commercial buildings. Still, many of the towns’ residents told Mashable that they were pleased the army had moved in. One of the women, Valentina Moskalenko, a pensioner, said in Ukrainian that she was elated when the troops rolled in. “I was trembling with happiness!” she explained, adding that much of the damage to two buildings on the main road had come at the hands of rebels, who fired Grad missiles at them, knocking massive holes in their sides. “They had the Grad trucks right over there in that field,” Moskalenko said. Back in Donetsk, loud explosions — seemingly from the edge of the city — continued in the late afternoon through the evening, when Russia’s state-sponsored news agency RIA Novosti reported that the Donetsk militia was ready for a cease-fire to prevent further humanitarian catastrophe. “We hope that the international community will influence the bloodthirsty Kiev government,” newly appointed Donetsk People’s Republic prime minister Alexander Zakharchenko said, according to RIA Novosti. As dusk fell over the eastern steppe, there was no word as to whether Kiev, with its army on the verge of an assault to reclaim the city, would agree to the proposed armistice.